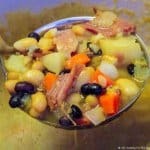 What to do with that leftover ham? This is a great problem to have. Ham is so useful for now or for later. Let’s review a few great options. I will be talking about a store bought precooked ham. They might be refrigerated sealed at the store, and they might be spiral cut. If you have a different type of ham, I have provided some links with options for most other types of hams. Before we proceed, please be sure we are dealing with safe leftovers. If it was left in that temperature range for more than 2 hours, it should be considered contaminated and decarded. 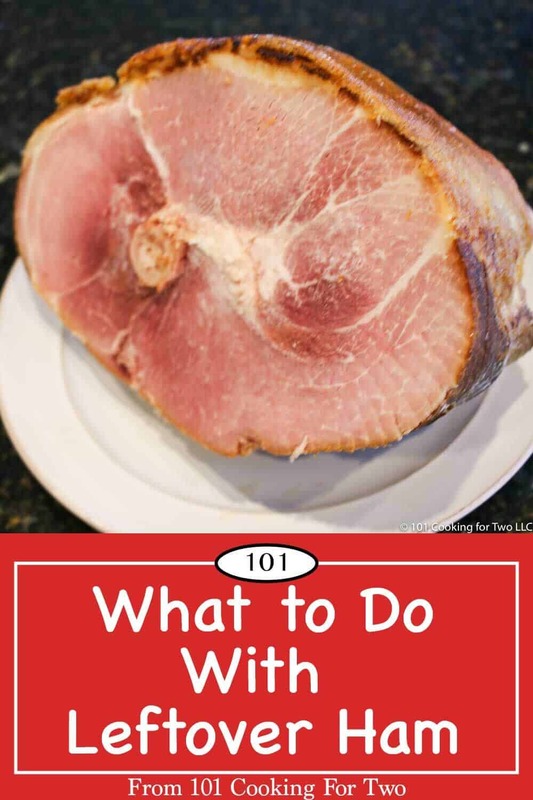 The ham should have been properly thawed if frozen and stored refrigerated under 40 degrees. And have not spent more than two hours in the food danger zone of 40 and 140 °F during serving. See Summer Food Safety for a more detailed discussion. The first option is the refrigerator. 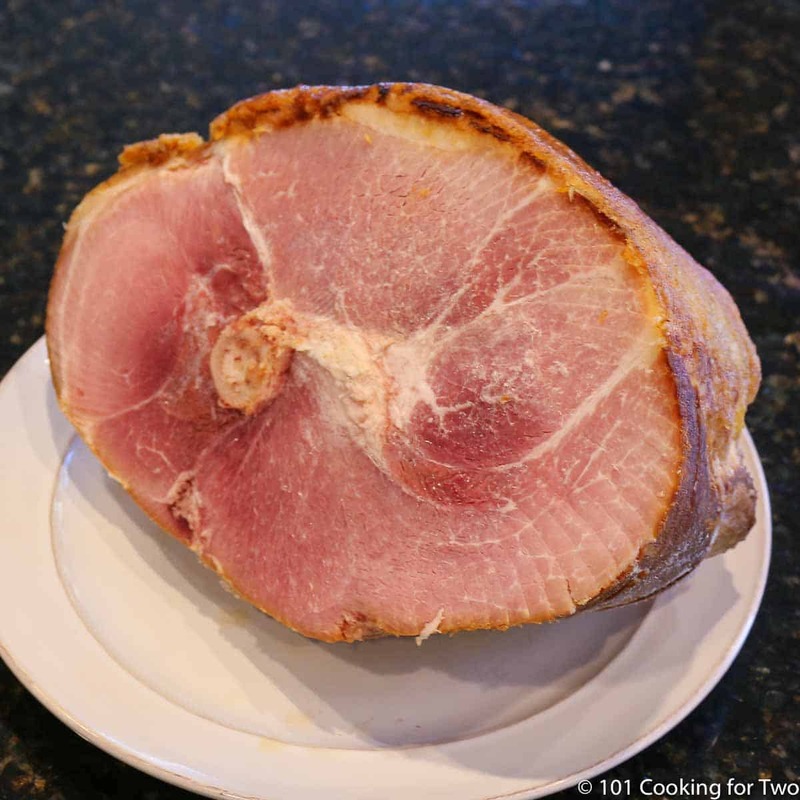 Generally, ham can be stored in the refrigerator for 3-5 days, but it can vary some by the type of ham. Please see the FoodSafety.gov Ham Storage Chart for details if you have something other than a store bought precooked ham. There are those old wise tails that you can not freeze ham. They are so wrong. Ham and ham bones both freeze great. If I know that I’m freezing some of the ham for later, I do that part of the ham as soon as possible. I seal it well, and if it is a large amount, I divide it into smaller units. Most ham that you and I are dealing with are good for 1-2 months frozen. Again there is some variability by type of ham. Please see the FoodSafety.gov Ham Storage Chart for details. To thaw your ham after it’s been frozen allow it to defrost in the refrigerator. Depending on the size, it should thaw in about 24 to 48 hours. Don’t forget you can also freeze the ham bone. We always buy too much ham just to have this later. Great comfort food. Old fashioned scalloped potatoes and ham, an excellent recipe for an everyday meal or potluck dinner. One of my favorite comfort foods that is easily made from scratch. With these easy to follow step by step photo instructions to get it perfect the first time and every time. 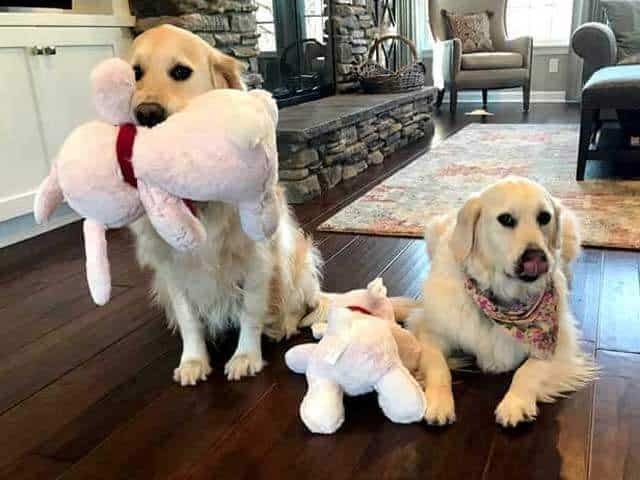 What to Do With A Ham Bone? There is not much you can do with a ham bone other than soup. But it is a great option since the broth is just wonderful. From a “cooking for two” viewpoint, these recipes are just too big unless you have freezer space. If you do, these are great options. If you don’t have freezer space, give the ham bone to a friend. Ok, a special Easter bonus. Not everybody had ham. vegetables to use, and how to prepare them. you give this gorgeous vegetable tart technique a try soon. Enjoy! Cheesy Chicken Enchilada Dip is loaded with cheese, chicken, and a little bit of spice too! Add some chips and this is the perfect easy appetizer for a party! Cheesy Chicken Enchilada dip is my go-to recipe when it comes time to take an easy appetizer to a party. 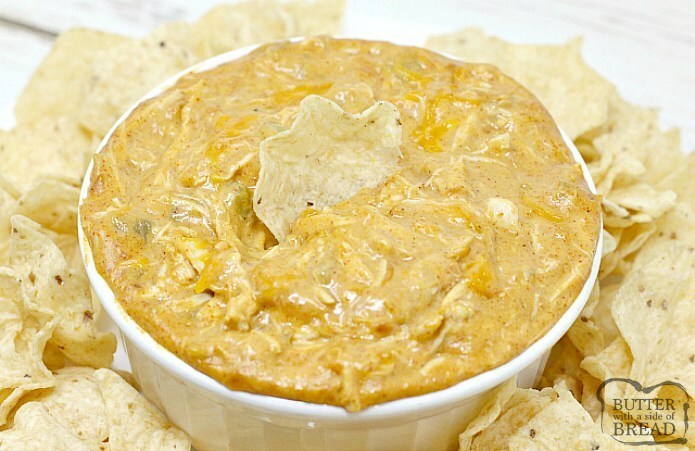 This chip dip is super easy to make and is absolutely delicious! You can make Mexican dip recipe in the microwave or in a pan on the stove, or you can even throw everything together in a mini slow cooker and heat it up for a few hours. Cheesy Chicken Enchilada Dip is an easy appetizer that is always a big hit. This dip is best served warm so I usually make it and then transfer into a small slow cooker when I take it to a party so that I can keep it plugged in and keep it warm the whole time. This recipe is my favorite chip dip -all the flavors of a chicken enchilada in a bowl! And of course, anything with cheese is amazing! What’s the best cheese to use in a chip dip? You can use regular cheddar cheese in this cheesy dip, but a lot of other types of cheese work well too! Because of the green chiles and taco seasoning in the dip, the flavors work well with Monterey Jack cheese or a fiesta Mexican blend of cheese. Use your favorite shredded cheese or a combination of two or three of your favorites! 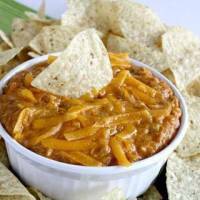 You can make this chip dip recipe on the stovetop or in the microwave. Both methods are quick and easy! –STOVETOP METHOD: Combine all of the ingredients in a medium saucepan. Heat over medium heat, stirring occasionally until cheese is melted and everything is warmed through (about 6-8 minutes). –MICROWAVE METHOD: In a 2 quart microwave-safe dish, combine all of the ingredients and microwave on high for about 4-5 minutes. Stir and then microwave about 3-4 more minutes or until heated through. And that’s it! So easy! You can serve the dip immediately or you can transfer to a small slow cooker and keep it turned to warm until ready to serve. Any leftovers can be stored in the refrigerator for a few days. To reheat the leftover dip, just heat it in the microwave at 30 second intervals until warmed all the way through. Serve this cheesy appetizer warm with tortilla chips. Cheesy Chicken Enchilada Dip is loaded with cheese, chicken, and a little bit of spice too! Add some chips and this is the perfect party food! STOVETOP METHOD: Combine all of the ingredients in a medium saucepan. Heat over medium heat, stirring occasionally until cheese is melted and everything is warmed through (about 6-8 minutes). MICROWAVE METHOD: In a 2 quart microwave-safe dish, combine all of the ingredients and microwave on high for about 4-5 minutes. Stir and then microwave about 3-4 more minutes or until heated through. And that’s it! So easy! What type of chicken is best in this appetizer recipe? You can use any type of cooked, shredded chicken, but I usually use rotisserie chicken in this recipe because it is so moist, flavorful and easy too! One of my favorite ways to make shredded chicken is in a slow cooker – all you have to do is place the chicken in a crockpot for about 5-6 hours on low with a can of chicken broth and it will just fall apart when it’s done cooking. Recently, I have discovered another way to cook and shred chicken by using an Instant Pot! I just place a few chicken tenderloins or 1-2 chicken breasts in my Instant Pot, set it on high pressure for about 7-8 minutes and then just a few minutes later I have perfectly cooked chicken that shreds easily with two forks – I still can’t believe how fast and easy it is! 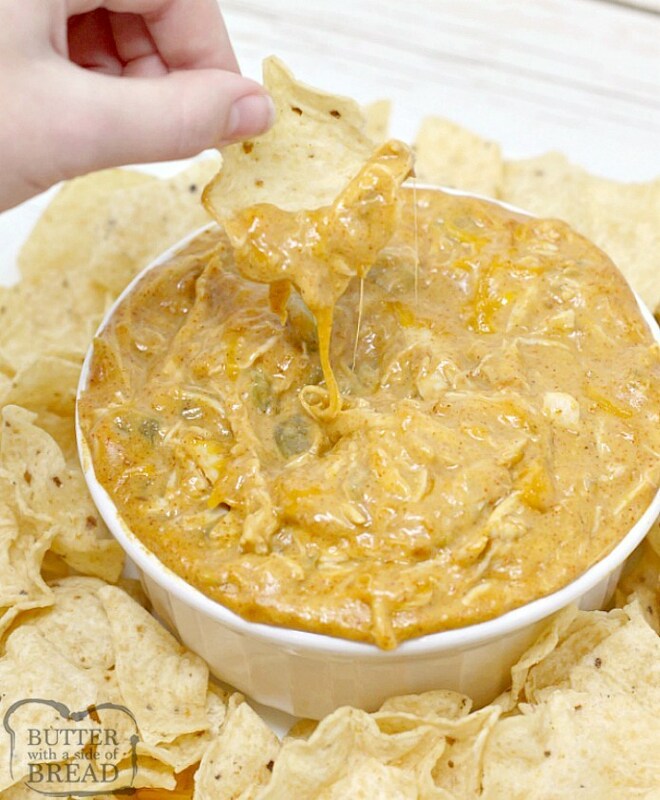 What do you serve with Cheesy Chicken Enchilada dip? 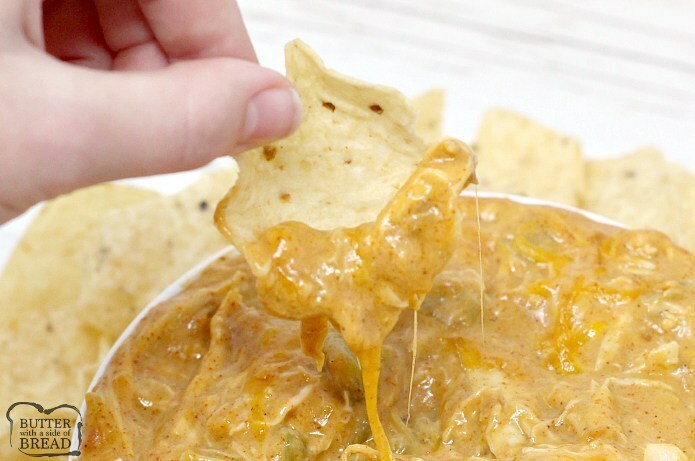 Tortilla chips are absolutely amazing with this dip – this dip recipe is perfect as a chip dip! Just make sure to use a sturdy chip – Tostitos scoops are one of the best chips for being able to hold a lot of dip! You can also use other types of crackers like Wheat Thins or Triscuits if you prefer. It would probably taste great with veggies also – carrots, peppers, cherry tomatoes, etc. You can also use this chicken dip as a filling for enchiladas or burritos or other Mexican recipes. Just wrap the filling in flour or corn tortillas and sprinkle some cheese on top. Bake at 350° for 20 minutes or until the cheese on top is melted. I also love to eat this dip as a chicken filling for lettuce wraps – just place a couple spoonfuls of the chicken mixture into a large piece of Romaine lettuce and fold up like a taco! Low carb and absolutely delicious!